Paul Bunyan Trail History - Tunnel Connection - Brainerd, Minnesota - Bike and snowmobile trail. This page is dedicated to the memories of Congressman Jim Oberstar and Terry McGaughey (“Mr. Paul Bunyan Trail”) for all their hard work and dedication that made the Paul Bunyan Trail what it is today. McGaughey is credited with the idea for the conception of the Paul Bunyan Trail in 1983 after the announcement of the closing of the Burlington Northern Railroad. With over 25 years of his life dedicated to promoting, lobbying and planning meetings in all 15 trail towns on his own free time, McGaughey earned the respect of the Brainerd Lakes Area as well as the connecting trail towns. His love for nature and his strong desire to keep our beautiful lakes area free from the clutter of more gas stations and convenience stores is a testament to the Paul Bunyan Trail and to the appeal of the Northwoods. James (Jim) Oberstar was an American politician who served in the United States House of Representatives from 1975 to 2011. A member of the Minnesota Democratic Farmer Labor Party he represented northeastern Minnesota’s 8th congressional district, which included the cities of Duluth, Brainerd, Grand Rapids, International Falls, and Hibbing. He was chairman of the House Transportation and Infrastructure Committee from 2007 to 2011, and ranking minority member prior to that. Oberstar used his influence to help raise awareness of bike trails and to promote healthy living and biking as a transportation alternative. The event “Ride With Jim” was created in 1997 with Oberstar hitting the trails for an annual ride and celebration of the Paul Bunyan Trail. In 2014, “Ride With Jim” was hosted by the Northland Arboretum in memory of these two great trail advocates. 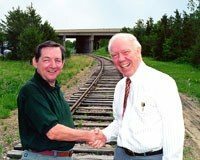 Terry McGaughey, Paul Bunyan Trail Volunteer Coordinator welcomes congressman Oberstar for a site inspection of the tunnel underpass project which was funded in the Transportation Bill. Congressman Jim Oberstar is the Senior Democrat on the U.S. House Transportation Committee that passed a massive public works spending bill on May 22nd. Oberstar acting as a co-chair included funding for Northeastern Minnesota Trail Projects. $640,000 for a tunnel underpass to replace an obsolete bridge for Highway 371/210 in Brainerd/Baxter. This will help extend the Paul Bunyan Trail south through Baxter and eventually to Crow Wing State Park. $240,000 is provided for the MI-GE-Cl Bike Trail in the Chippewa National Forest. This 8.7 mile trail will start at the popular Federal Campground on Pike Bay of Cass Lake and link to the Heartland State Trail at the City of Cass Lake becoming part of the interconnected Paul Bunyan, Heartland State Trail system. $3 million also provides funds to extend the Mesabi Bike Trail by 30 miles in the Grand Rapids area. Oberstar is considered by conservatives and liberals to know more about transportation than anyone else in Congress. Jim also is an active bicycle rider logging about 3,000 road miles per year. To recognize his bicycle advocacy the National Rails to Trails Conservancy awarded Oberstar the Congressional Leadership Award in 1995. In August of 1998 the league of American Bicyclists and Bicycle Magazine will present him with the first “Friend on the Hill” award. This award is named the James L. Oberstar Award. Oberstar participated in the dedication of the Sunrise Prairie Trail and rode the trail on his new Lemond bicycle. In July, he plans to bike the Paul Bunyan Trail for a ride with Jim Day. Watch for future detailed plans. 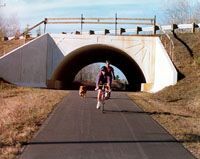 The new tunnel in Brainerd/Baxter will be similar to the this one on the Munger Trail near Moose Lake, Minnesota. Transportation Equity Act for the 21st Century replaces ISTEA that funded transportation enhancements from 1992-1997. TEA 21 makes available $650 million enhancements annually – 3.9 billion over six years. This represents a 40% increase over ISTEA (1992-1997).